Create heroic characters and guide them as they advance in power. Equip characters with everything they need to survive the perils of adventure. Guide characters through encounters, whether through wits and skill or strength of arms. Reward characters with glittering wealth and wondrous treasures. Challenge all characters, from novices to veterans, with over 140 creatures both fair and foul. 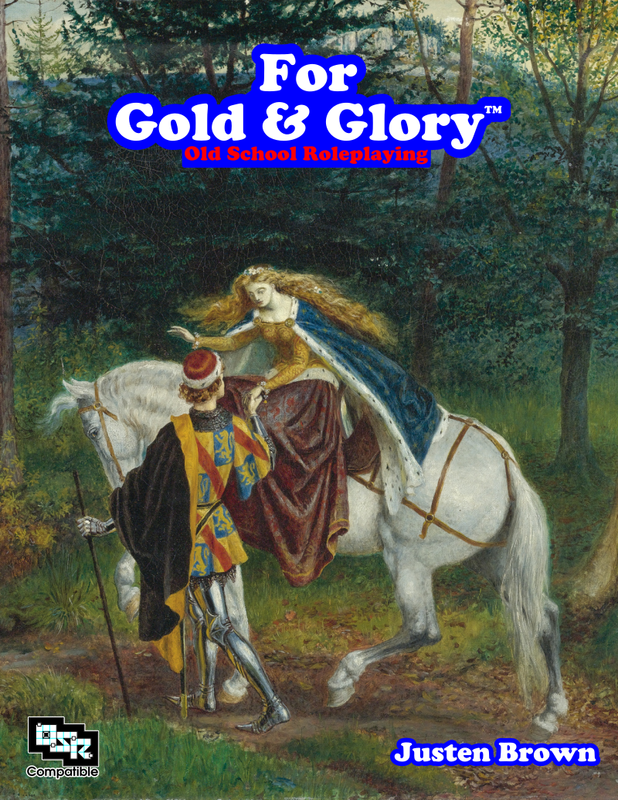 For players and game masters alike, For Gold & Glory is compatible with the second edition of the "advanced" version of the world's most popular role-playing game. I believe that the faded colors, as compared to the electronic version, is just how things are printed by Lightning Source. Some colors just don't translate to whatever printing system they have all that well. The files I upload for printing are, with the exception of not having the cover pages in the same document as the text, identical to the electronic version you can download here. I am sorry that you feel that the print quality is not good, and hope you can get a refund if you decide it's a dealbreaker. Have the double rows of the Strength table been fixed in the print version? Also, what is the benefit of buying the Premium Heavyweight version over the Standard Heavyweight color versions? But basically, standard heavyweight uses an inkjet printer while premium uses an actual offset press. There are three files here. Which is the most recent? For Gold & Glory 2.0.1 is the most recent. Hi, I am trying to find out who to contact about the ogl of For Gold & Glory and how to contact that person. Jay, you can contact me with questions or requests. The email address in the CC-BY-SA 4.0 statement in the Legal appendix still works: djhyland@gmail.com . A small error I noticed: the Strength table on page 7 has double rows for scores 3, and 4-5. Why are there now two files titled essentially the same PLUS a "revision a"? Which one of the THREE versions is the current? Hate to complain about a free item, but am I going to get the right version if I purchase multiple copies of the print for my gaming group? Version 2.0.1 is the latest revision. If you purchase print copies, you'll get this latest revision. I noticed that there are two print versions, a plain and a standard version. What is the difference? The two versions are a black-and-white printing and a color printing (the one that says "Standard"). They use the same weight of paper, and differ only by the color artwork (or lack thereof in the black-and-white artwork). Theoretically, DriveThruRPG and the other sites have a premium color option available which has heavier weight paper, but I didn't make a version for that option. Hello, I received a notice that this was updated, but both versions in my library for download list the version as: 2ND EDITION(v2.0: 8 September 2015). I do notice differences between the PDF's, though. Sorry if this is a dumb question. Can you let me know if the fgg.pdf or the For_Gold__Glory.pdf is the latest version? Thanks. Thanks for the question, Todd C and Timothy B. The fgg.pdf is the most recent version. The differences are very minor: I replaced two pieces of artwork with sharper versions (Portrait of an African Man, page 15 and Dark Thoughts, page 345) to make them look better, and fixed a typo or two. Next time around, I'll remember to update the date in the credits as well. Sorry about the confusion! Thanks for the update. That's helpful. Ability Score table needs to be updated... lines for 3 and 4-5 are duplicated. Well organized, and nice art. Nicely done! I really love this book...any plans to follow up with supplements on your end or via another 3PP? Thanks for the kind words! I do plan on making a campaign setting that uses For Gold & Glory's rules. It'll have some campaign-specific rules, such as kits, races, and spells. It won't be a rules supplement, per se, but it'll definitely have some new rules that should be able to be generalized to other settings. I was just wondering if you where still planning on doing a "campaign-specific rules, such as kits, races, and spells" release sometime? Also I purchased a printed "For Gold & Glory" back in 2015, I was wondering is there any change in the rules/game play etc. with the revisions. Reason I ask is I have no way to download or review the pdf's. Thanks! This is a great product. Its almost 100% exactly what I was looking for. If you ever loved the older versions of D&D before the WotC days, then this product is for you. Is there any plan to release a print version of this? Indeed there is! I've submitted the files to make the print version, and assuming they're acceptable, there'll be a print version up in a few days! Dieses Produkt wurde am September 11, 2015 in unseren Katalog aufgenommen.